So, are we tired of this Lighthouse yet? 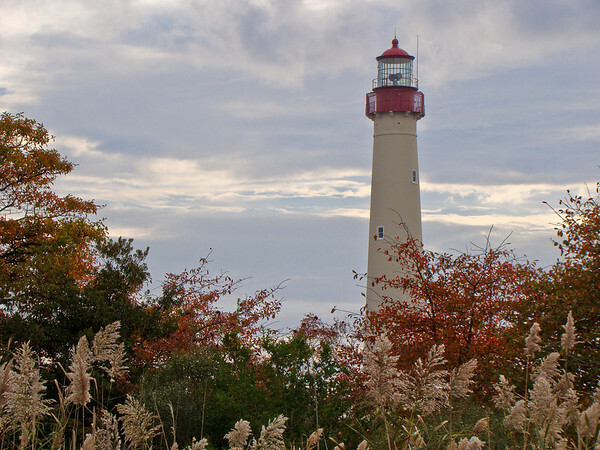 Cape May Light. This time framed in red sumac leaves and twisted sumac branches. I knew this shot would need cropping in software once I got it home and planned it that way. Sony DSC H50 at about 70mm equivalent for framing. F4 @ 1/125th @ ISO 100. Programmed auto. Cropped in Lightroom from the bottom. Recovery for the sky behind the light. Blackpoint to the right. Added Clarity and Vibrance. Sharpen Landscape preset. 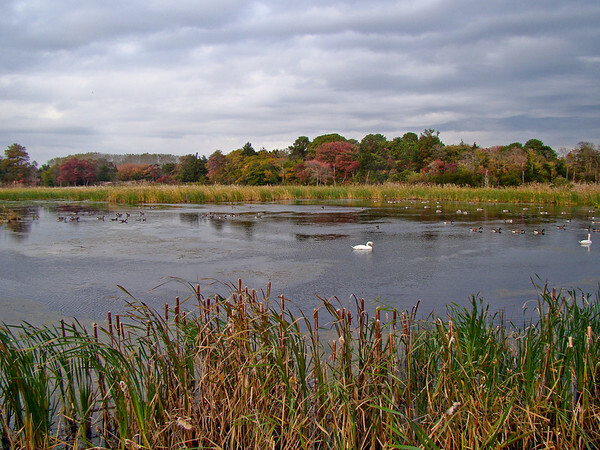 I photographed this pond at Lighthouse State Park in Cape May NJ two days before with moody cloud cover. This day there were still clouds, but the autumn sun transformed the scene. The reflected sky…with pond weed showing through…as well as the band of fall color separating the clouds from their reflections…there is a lot to look at in this image. Sony DSC H50 at 31mm equivalent. F5.6 @ 1/250th @ ISO 100. Programmed auto. A touch of Recovery in Lightroom for the clouds and reflections. Added Clarity and Vibrance. Blackpoint to the right. Sharpen Landscape preset. I used the selective HSL tool to increase the Luminance of the red-orange of the fall leaves to make them stand out more. 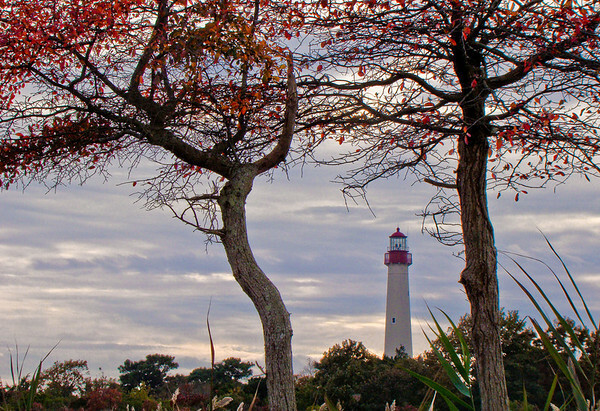 Yes, it is another view of Cape May Lighthouse. Another. But honestly, it is a photogenic light and this year there were simply lots of good views. For this shot, I used the flip out LCD on the Sony again to get down lower, placing the cattail heads and foreground grass as a strong element in the composition. The Light holds it own on the horizon (carefully placed according to the rule of thirds), and the heavy clouds add drama. I used Program Shift to select the smallest available f-stop for greatest depth of field to keep both foreground and Lighthouse in focus. Sony DSC H50 at about 60mm equivalent (zoomed up for framing). F8 @ 1/125th @ ISO 100. Programmed auto with program shift. In Lightroom I did my usual Clarity, Vibrance, blackpoint to the right, Sharpen Landscape stuff…but then I drew a Graduated Filter effect down from the top to darken the sky for drama, and one up from the bottom to increase both clarity and contrast for that chiseled by light look. This is as close to HDR as I get. We seem to be getting a lot of these moody fall days. I manage at least two falls each year. One in Maine, one in New Jersey, and one in New Mexico: mid-October, late-October, and mid-November. This year I will be in Germany in mid-November. I am not sure if that is fall there or not. We shall see. 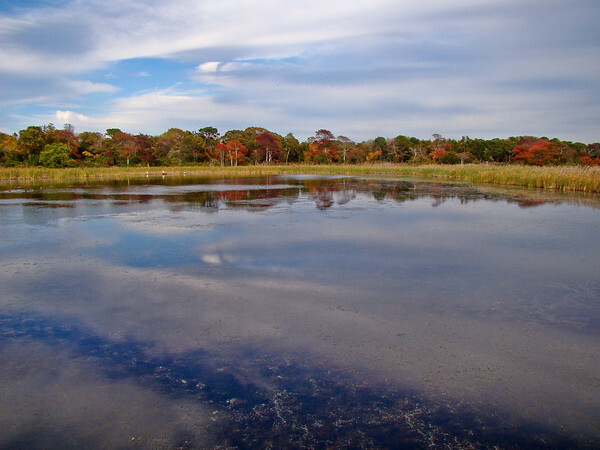 This is a little pond on the back side of Lighthouse State Park in Cape May, New Jersey. I have never seen as may Mute Swans as there are this year. They are everywhere there is fresh water. A touch of fall in the foliage on the far side and the cat-tails in the foreground give the image some depth. Sony DSC H50 at 31mm equivalent. F4.0 @ 1/250th @ ISO 100. Programmed Auto. Recovery in Lightroom for the sky. A touch of Fill Light for the foliage. Blackpoint slightly right. Added Clarity and Vibrance. Sharpen Landscapes preset. You may get tired of this Lighthouse, but I seem to have shot it from all angles on this trip. 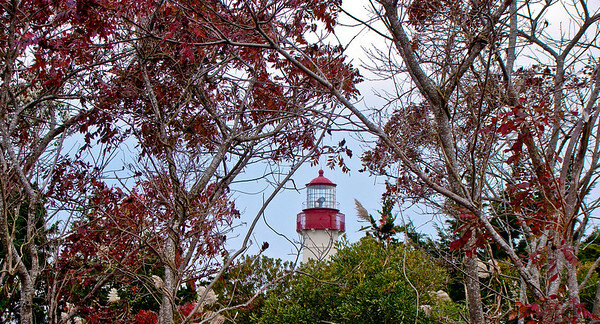 I could not resist these very bright trees and finding an angle that would frame the the lighthouse. I got down low and used the flip out lcd of the H50 to compose the shot. Sony DSC H50 at 35mm equivalent. F5.6 @ 1/400 @ ISO 100. Programmed Auto. Recovery in Lightroom for the sky. A bit of fill light to pick up the leaves in the tree and the textures of the tree trunks. Blackpoint to the right to intensify the image. Added Clarity and Vibrance and Sharpen Landscapes preset. Finally I went in with the selective HLS tools and increased the luminance of the red of the leaves. 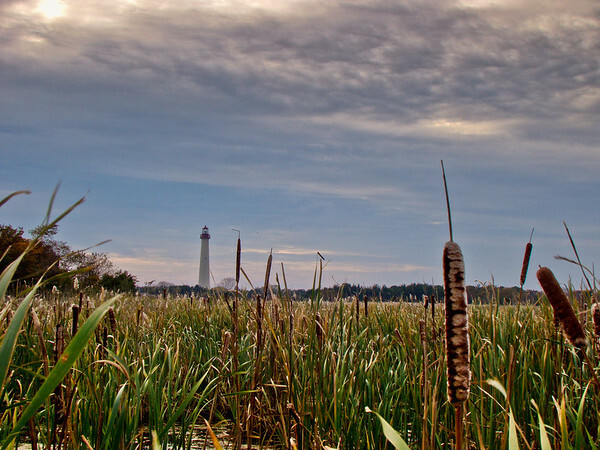 And, for contrast, here is a shot with more lighthouse and less trees, taken from the same spot by zooming in. This is at 120mm equivalent. For this shot I used Program Shift on the H50 (easy to do as it is one of the on screen options accessible without opening the menu system) to select the smallest aperture and increase depth of field to keep both foreground and the lighthouse in focus. It received very similar treatment in Lightroom. So what do you think. Wide frame or tight? 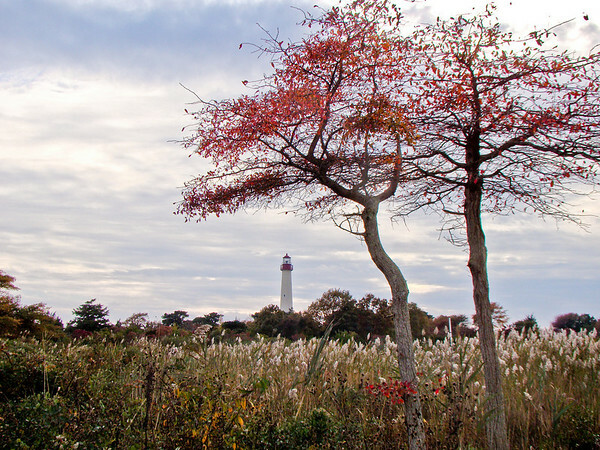 Cape May Light on moody Autumn afternoon. A touch of color in the trees with the lacy phragmities reeds (of questionable parentage…native or invasive??) form a intricate cup to support the solid shaft of the light standing tall against the cloudy sky…classic stuff! Sony DSC H50 at about 135mm equivalent. F5.6 @ 1/500 @ ISO 100. Programmed auto. Recovery in Lightroom for the sky and clouds. A touch of Fill Light for the foreground. Blackpoint to the right for intensity. Added Vibrance and Clarity and the Sharpen Landscapes preset. Capy May Gingerbread is always a treat. And the fad for white gingerbread is well past, or never caught on in Cape May. The Victorian era homes, now mostly B&Bs are painted as they were when new, in a full rainbow of colors. Even in the light of a cloudy dawn they have a glow. Sony DSC H50 at about 110mm equivalent. F4.0 @ 1/60th @ ISO 100. Programmed auto. This is another shot that required Lightroom’s Graduated Filter to bring up the foreground and make the scene look something like it would to the naked eye. GF from the bottom with added exposure, clarity, and just a touch of contrast. General application of Recover for the sky. Added Clarity and Vibrance and Sharpen Landscapes preset. Cropped slightly from both bottom and top for composition. For those of you who love Gingerbread, I walked around Cape May late yesterday afternoon as the rain held off and shot a quick gallery of Gingerbread images, using my little pocket Sanyo camera, to show my wife what Cape May is like. You might enjoy it too. 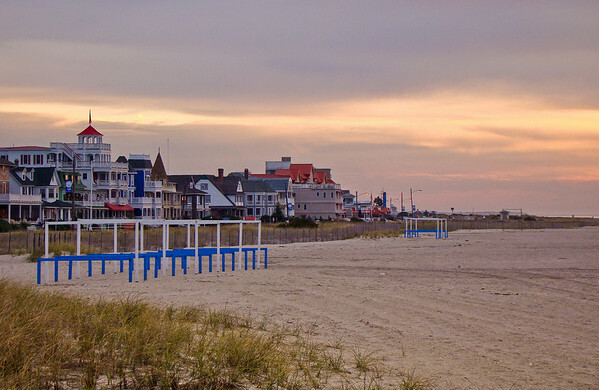 Best Quality Cape May Gingerbread on Posterous.